Dan & I just wanted to say Thank you for your help with our wedding – it was just perfect. The wedding exceeded all our expectations. We had a fabulous time and so many of our guests said it was the most romantic wedding they have been to. Thank you Anna we couldn't have done it without you. 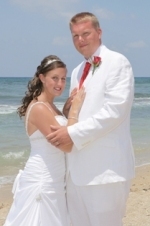 Our wedding in Paphos was a dream come true for us and with no stress. From booking the wedding to us leaving Cyprus Anna was always on hand. The whole process was very relaxed and completely removed any anxieties we might have had left but always professional! We have finally come back down to earth after our fantastic wedding and would like to thank you & Marios for helping to make our Wedding Day so special. Anna, your attention to detail is second to none and we had many lovely comments about the table setting and decor. Marios, our photographs are outstanding and have received many comments about how fantastic they are. Thank you to a wonderful team! Thank you Anna so much for creating our perfect wedding day!! Everything was just perfect! The colour scheme was simply stunning and was even better than we could of ever imagined! and the flowers, cake and table decorations were gorgeous and exactly what we had in mind! They all fitted together wonderfully and your attention to detail is outstanding!! The ceremony ran smoothly and our guests were blown away with how beautiful the day was. We would thoroughly recommend Anna to anyone thinking of getting married in Cyprus, As well as being a lovely person she loves her job and is extremely good at what she does!! We would like to express our eternal gratitude to Anna of Paphos Wedding Belles who was our wedding planner. Anna was fantastic and went above and beyond, words do not do justice to how fantastic our day was, and I would encourage anyone looking to get married in Paphos to go and speak with Anna because you will not be disappointed. Thank you again for everything that you have done for us. Andrew and I just wanted to say a big thank you to you Anna for all of your help to make our wedding so beautiful and perfect. We (and all of our guests) had a fabulous time and still talk about it till this day. You were a lifesaver, we would not have known where to start without your help. Thank you for all your patience, good judgment and incredible planning. As soon as we met you put both Andrew and I totally at ease. We knew you would make sure that the wedding would go smoothly, and it did. There was absolutely nothing for us to worry about. Also, all of your recommended vendors were truly a pleasure to work with, Mario our photographer was great our photos are truly the best wedding photo's we have ever seen and our house is full of them and our wedding video exceeded all our expectations. As soon as we walked into the reception room I could of cried as the attention to detail was out of this world and the whole setting was stunning. The flowers were beautiful, the cake delicious, and everyone is still talking about how great the day & night was! We had such a wonderful time, we wish we could do it all over again (can we renew our vows after only four months!?) One of the greatest pleasures was getting to know you. Thank you, we couldn't have done it without you - you really did make our wedding dreams come true! Anna & Marios, Thank you for giving us the wedding of our dreams. The day was just perfect, everything ran so smoothly thanks to your excellent planning. Everyone was blown away with both venues, especially the decorations at the reception. We couldn’t have wishes for two more professional, yet friendly people to plan and photograph our day. It is impossible to put into words how amazing you made our wedding and we cannot begin to thank you enough. Thank you so much for all the effort that you put into making our wedding day special. We will always look back with fond memories and remember all the hard work that you put in before, during and after our wedding day making everything go smoothly. After the wedding we had many comments from our friends and family on how lovely everything was and how amazing our photographs looked. Thank you for making our day special. Ian and I were lucky enough to visit Cyprus last year to find our perfect venue and find a wedding coordinator to help us organise our special day. We met with many different wedding coordinators during our visit and found that we instantly warmed to Anna. Since that initial meeting last year, Anna has provided us with continuous help and support to organise different aspects of our wedding. We had the most wonderful day, which truly exceeded our expectations. Many of our guests commented on our beautiful decorations and flowers, which is a reflection of Anna’s hard work and attention to detail. Marios’s photography was brilliant and our photos will enable us to treasure memories of our special day forever. Thank you to both Anna and Marios for making our wedding in Cyprus so perfect. 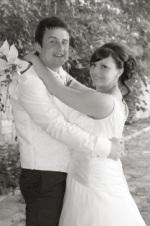 Our wedding in Cyprus was booked and organised by Anna, and the photography by her husband Marios. It was the most spectacular day that exceeded our expectations beyond belief. Everything ran smoothly, nothing was too much bother for Anna, and it was a relaxed atmosphere all round! When it comes to wedding planning, Anna has mastered the art of perfection, the detail at our reception blew us away, the vibrant colour scheme was absolutely gorgeous, and I didn't want to touch anything! The photographs are stunning, it was so difficult choosing which pictures to have in our album, Mario's worked wonders and is obviously an extremely talented and professional photographer, he was so patient especially with our four year old son! I will never forget the high level of service we received all round. I highly recommend Wedding Belles if you are considering a wedding in Cyprus, especially if you want the wedding of your dreams to become a reality like ours was! We would like to say a great big thank you to the Paphos Wedding Belles team for creating our dream wedding. Special thanks to Anna for all her help and support in the lead up to our amazing day, nothing was too much trouble. Our wedding pictures are fabulous; words can’t describe how happy we are with them they are simply sensational. Marios is a brilliant photographer who takes alot of pride and care in obviously doing something he loves. So once again thank you very much, our wedding day was more than we could ever of wished for. We would both like to say again and again a massive thankyou for all your hard work and for helping to make our wedding day so special- everything was just perfect! 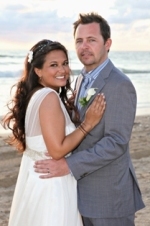 We would like to thank Anna and Mario for all of the help they have given us throughout planning our wedding day. From the first time of contacting Anna, right through to after the Wedding day, she couldn't have done enough for us, nothing was a problem and she made sure our Wedding day was exactly what we wanted. The day was absolutely perfect and one that ourselves and our wedding guests will always remember. Our Wedding photos are fantastic and the DVD is so professional, Marios made us feel at ease and made sure he captured moments of the day perfectly. A heartfelt thank you for helping us to make our Wedding Day the most perfect day of our lives. Please do not hesitate to contact us if your would like to have your Wedding in Cyprus.